Thank Asheville City Council for Making Public Transit Their #1 Priority! Did You Miss Our Annual Gathering? You Can Still Take Action Here! We had a wonderful evening hanging out with MountainTrue members at our Annual Gathering on Wednesday night. If you missed it, you can still take action to protect WNC’s mountains here. We hope you’ll get involved and join us next time! 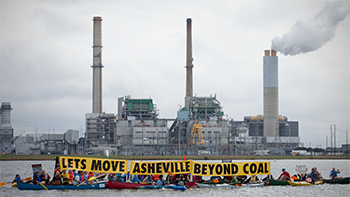 What It Is: As members of the Asheville Regional Transit Coalition (ARTC) and the 100% Renewables Coalition, we’ve had some exciting victories this year. Asheville City Council passed a new Transit Master Plan that lays out a path to more frequent and widespread transit service in Asheville over the next ten years, and City Council adopted a 100% Renewable Energy Resolution to transition all city municipal operations to 100% renewable energy by 2030. What You Can Do: These plans are a great first step, but now we need City Council to commit to turning them into action. Tell City Council: Thank you for voting to approve the 100% Renewable Energy Resolution and Transit Master Plan. Now, commit to funding Asheville’s 100% Renewable Energy Resolution and Transit Master Plan starting in next year’s city budget. MountainTrue is a proud member if I Heart Pisgah, a group of over 100 organizations and businesses and thousands of individuals who support more protected areas in Nantahala-Pisgah National Forest. Go to the I Heart Pisgah website here to take action to protect your favorite places in the national forest. You can write about what you love to do there and why you want to see it protected – the more you make it your own, the better. Your comments will go to the Forest Service before the release of the new Nantahala-Pisgah Forest Management Plan. What It Is: The Blue Horizons Project is an outgrowth of MountainTrue’s work to shut down the Asheville coal plant and encourage Duke Energy to increase their investment in energy efficiency programs. Buncombe County’s energy usage is continuing to increase, and energy demand is highest on the coldest days of winter. If this pattern continues at the current rate, a new natural gas plant known as a “peaker plant” would need to be built to serve Buncombe County to meet the highest peak demand in winter. The Blue Horizons Project believes that instead of building more fossil-fuel plants, we can organize as a community to use energy more efficiently and explore clean energy alternatives. What You Can Do: Go to the Blue Horizons website to find ways to make your home and/or business more energy-efficient. You can also sign up for the Blue Horizons newsletter or contact Blue Horizons Project Coordinator Sophie Mullinax to help more people in Buncombe County save energy and money through the project. What It Is: MountainTrue is a leading organization of Family-Friendly Affordable Buncombe, an initiative to leverage the unique opportunity provided to our community by the sale of Mission Health in order to make our region more affordable for Buncombe County families and workers. Specifically, we believe the new property tax revenue created by the sale of Mission Health should support early childhood education, attainable family housing and better public transit. What You Can Do: Learn more about Family-Friendly Affordable Buncombe on our website and sign on as a supporter. Audrey & Frank Peterman are tenacious advocates for breaking the color barrier and making America’s natural treasures accessible to all Americans regardless of race. They will give the keynote address at UNCA’s Spring Greenfest 2018 on March 26. With great natural beauty come great advocates. Many organizations have formed over the years to preserve Western North Carolina’s natural places and unique character. That’s why this year, MountainTrue and more than 20 area conservation and environmental organizations are combining forces to celebrate Earth Day throughout the entire month of April. We’re calling this collective effort WNC For The Planet, and we’re teaming up with local businesses, universities, community groups and individuals like you for a month of environmental service, educational opportunities, and celebrations in Asheville and across Western North Carolina. As part of the effort, WNC for the Planet launched an online community calendar at wncfortheplanet.org with educational and service opportunities for people of all ages and from all walks of life. Come hear Audrey & Frank Peterman speak on March 26 at UNCA about their book, Legacy on the Land: A Black Couple Discovers Our National Inheritance and Tells Why Every American Should Care. Recycle items that might otherwise end up in the landfill at Asheville GreenWorks’ Hard 2 Recycle event, and catch a screening of the documentary Look and See: A Portrait of Wendell Berry put on by the Organic Growers School. Or, learn how to build a bat box, restore native plant and animal habitats, and weatherize your home to fight climate change. Keller Williams Realty and Movement Mortgage pitched in for a stream clean up last year. WNC For The Planet also includes a Business & Community Challenge allowing area businesses, civic organizations and community groups to create teams and compete for prizes and bragging rights. Here’s how it works: Each team earns Planet Points according to how much you accomplish at WNC For the Planet events – how much trash you collect, how many trees you plant, etc. – and at the end of the month we rank your team against other teams. The harder your team works, the more points you earn. The more points you earn, the more you’ve helped keep Western North Carolina beautiful. WNC for the Planet’s Earth Month culminates with a weekend of celebrations, including Earth Day Kids’ Festival with RiverLink on Saturday, April 21st, and MountainTrue’s annual Earth Day Vigil with faith groups on Sunday, April 22nd. Join us for a final Earth Day party to celebrate our hardworking volunteers and environmental advocates at New Belgium Brewing Company. Members of Piney Mountain United Methodist Church during their light bulb drive, August 2017. It was something you don’t see every day: in the Hominy Valley just east of Candler, NC, a man pulls a wagon of light bulbs while another drags a wheelbarrow full of green peppers, okra and tomatoes. Winding around the neighborhood, the small group knocks on the doors of 35 homes, and when their neighbors open, they do not ask for money or signatures. Instead they hand out 16 energy-efficient LED light bulbs to each home free of charge along with some fresh produce, and invite them to a community cookout and a series of free classes on creation care. These generous visitors were congregants of Piney Mountain United Methodist Church for their LED light bulb drive last August. Piney Mountain, known for being a “working church” that serves in the Hominy Valley community, breaks the mold of what may be expected of rural congregations: the church has been incredibly active in the mission to protect our mountains. Pastor Bates was determined to connect his parish’s love of the land with an understanding of how climate change affects the earth and how they care for their neighbors. In 2016, Bates received a $1,000 Thriving Rural Communities grant for the neighborhood light bulb drive from the Duke Divinity School Endowment. Piney Mountain has now distributed over 1,300 energy efficient LED light bulbs to help lower their neighbors’ energy bills and reduce carbon emissions at the same time. LED light bulbs are 80% more efficient than regular incandescent light bulbs, and even more efficient than the spiral-shaped compact fluorescents (CFLs.) They’re also safer than CFLs since they do not contain mercury. On top of the energy savings, the LED light bulbs will eliminate about 1,000 pounds of carbon emissions per year – the carbon equivalent of planting 15,000 trees in their community over the next ten years. Piney Mountain goes door-to-door in the neighborhood surrounding their church in the Hominy Valley, east of Candler, NC, to build community and create energy savings for their neighbors. Pastor Kevin Bates (left) and a Piney Mountain congregant (right) load boxes of LED light bulbs into a wagon at church. Bates adds that the deep connection to the land felt by many parishioners allows them to feel and respond to climate change on an emotional level. “My people have noticed that they have changed when they plant in the ground, and they have even changed the way they fertilize because of changing snow patterns,” Bates says. Piney Mountain offered free public classes last fall on home energy savings, composting and canning to keep fostering creation care, and used local knowledge to teach the classes. “I think canning was the best class that we had. I don’t know how many older grandmothers have said ‘I wish my grandchildren and kids knew how to can, but they just bring their tomatoes over here and make me do it,’” Bates laughs. Many residents of the Hominy Valley make lifestyle choices that, while sometimes considered part of a recent wave of trendy “green” practices, are actually long-standing traditions in rural communities that just make sense economically. In the home energy savings class, Bates realized that most of the participants still used clotheslines and didn’t need to convert back to them to save energy like they might in more urban areas. Bates serves on the Steering Committee for the Creation Care Alliance, and hopes Piney Mountain will offer more classes in the spring. Piney Mountain also plans to work more closely with the Energy Savers Network and to help make Buncombe County’s recently adopted resolution for 100% renewable energy by 2042 a reality. Fittingly, Bates’ personal call to this work also connects to an agricultural vision. He speaks of the Koinonia Farm in Georgia that was founded in the early Civil Rights Movement by Clarence Jordan, who believed that black and white people need to live and work together in order for true reconciliation to occur. Are you clergy and interested in bringing creation care back to your faith community? Sign up now for CCA's clergy retreat by Jan. 22! Would you like to connect to the Creation Care Alliance’s network of faith communities caring for our mountains in Western NC?